The Trump administration is to reinstate all US sanctions on Iran removed under the 2015 nuclear deal. The White House said it was “the toughest sanctions regime ever imposed on Iran” and targeted Iran’s energy, shipping and banking sectors. However, eight countries will not be penalised by the US for continuing to import Iranian oil. EU states which backed the deal have said they will protect EU firms doing “legitimate” business with Iran. President Donald Trump withdrew from the deal in May, describing it as “defective at its core”. “Sanctions are coming,” he tweeted after Friday’s announcement, referencing the TV series Game of Thrones and its motto “Winter is coming”. The US has been gradually re-imposing sanctions since it unilaterally withdrew from the agreement, but analysts say this move is the most important because it targets the core sectors of Iran’s economy. An Iranian foreign ministry spokesman said Iran was unconcerned at the return of sanctions, Reuters reports. The agreement saw Iran limit its controversial nuclear activities in exchange for sanctions relief. Barack Obama, the US president at the time, had argued the deal would prevent Iran from developing nuclear arms. The UK, France, Germany, Russia and China were also parties to the 2015 accord and have stuck to it, saying they will set up a new payment system to maintain business with Iran and bypass US sanctions. 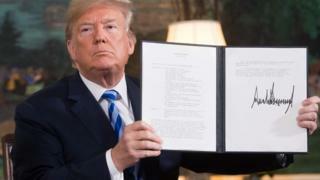 Mr Trump argues that the terms of the deal are unacceptable and it has not stopped Iran developing a ballistic missile programme and intervening in neighbouring countries, including Syria and Yemen. Iran has accused Mr Trump of waging “psychological warfare”. The Americans are acting on their own here because most of the rest of the world wants to preserve the Iran nuclear deal. Treasury Secretary Steve Mnuchin said they were determined to aggressively enforce the sanctions but they will have to balance that with the need to maintain relations with allies, and to keep the oil market stable. Mr Mnuchin said that Swift, the financial messaging service based in Brussels, could also be subject to sanctions if it worked with Iranian institutions blacklisted by the US. The US sanctions will come back into force on Monday 5 November, covering shipping, shipbuilding, finance and energy. The names of more than 700 individuals, entities, vessels and aircraft will be put on the sanctions list, including major banks, oil exporters and shipping companies. They are the second lot of sanctions re-imposed by Mr Trump since May. He set out 12 demands that Iran must meet in order to have the sanctions lifted. These include ending support for terrorism and military intervention in Syria, as well as completely halting nuclear and ballistic missile development. What exemptions are being made? The sanctions penalise other countries which do business with Iran. However, Mr Pompeo explained that some countries could not halt imports of Iranian oil immediately and they had been granted waivers on condition that they reduced them and eventually ended them entirely. US allies such as Italy, India, Japan and South Korea are among the eight, the Associated Press reports. Turkey also obtained a waiver, Reuters news agency reports. Foreign ministry spokesman Bahram Qasemi told state TV that Iran had “the knowledge and the capability to manage the country’s economic affairs”. “The possibility of America being able to achieve its economic goals through these sanctions is very remote and there is certainly no possibility that it will attain its political goals through such sanctions,” he said. What do EU states say? In a joint statement, the foreign ministers of the UK, Germany and France, and EU foreign affairs chief Federica Mogherini said they “deeply” regretted the US decision to restore sanctions. “We are determined to protect European economic operators engaged in legitimate business with Iran, in accordance with EU law and with UN Security Council resolution 2231,” they said. How did Trump’s GoT meme go down? Meanwhile, social media picked up and parodied the tweet. Several tweeters posted memes featuring Robert Mueller, the former FBI chief leading the inquiry into allegations that Mr Trump’s 2016 election campaign colluded with Russia. Other tweeters reminded the president that the US mid-term elections, when the Democratic Party hopes to generate a “blue wave” of victory against Mr Trump’s Republicans, are also coming next week.